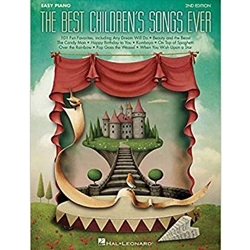 This amazing collection features over 100 songs kids love in one handy songbook! Arranged for piano and voice with guitar chord frames, it will provide hours of playing fun for parents and teachers! Songs include: Any Dream Will Do · Beauty and the Beast · The Candy Man · Do-Re-Mi · Frere Jacques (Are You Sleeping?) · Hakuna Matata · I'm Popeye the Sailor Man · If I Only Had a Brain · Let It Go · Michael Row the Boat Ashore · On Top of Spaghetti · Puff the Magic Dragon · The Rainbow Connection · Rubber Duckie · A Spoonful of Sugar · This Old Man · Winnie the Pooh · Yellow Submarine · and many more.